Your State Assembly Representative, or Ahli Dewan Undangan Negeri (ADUN), represents you in the State Assembly. They are your main link to the decision makers of the country. A State Assemblyman and a Member of Parliament play similar roles as law makers or legislators. The former makes state laws, while the latter makes federal laws — both in accordance with the Federal Constitution. For example, the state can pass laws on matters relating to land, agriculture, forestry, local government, riverine fishing and Muslim law, among others. It shares jurisdiction with the federal government on matters relating to social welfare, scholarships, protection of wildlife and town and country planning. State legislation does not cover areas such as internal security, defence, civil and criminal law, citizenship, finance, communications, health, labour and commerce and shipping industry. As laid out by Dr Azmi Sharom, associate professor of Universiti Malaya (http://getanmp.blogspot.com/2008/02/mps-role-jaga-longkang-settle-saman.html), your ADUN's primary duty is to debate and vote on the proposed laws (known as Bills) to ensure that the best possible laws are made. Therefore, they should be well-informed about the Bills they are discussing to be able to debate intelligently. Your ADUN also helps to check and critique the way government policy is made and implemented and to hold the Executive accountable and help prevent abuse of power. Your ADUN may also raise issues that are of concern to their constituency, which may be discussed and even legislated. If you would like to raise an issue or a concern to YB Edward Lee, you can contact him at edwardlee.pj[at]gmail.com. There are 13 State Legislative Assemblies (Dewan Undangan Negeri or DUN) in Malaysia, corresponding with the 13 states. Each DUN comprises the head of state, a Speaker and elected representatives. State representatives are chosen via state elections, usually held simultaneously with federal elections. In Selangor, for example, there are 56 ADUNs. A state assembly member's term is limited to five years. The state assembly must be dissolved before or upon expiration of its term for a fresh election to elect its members. For the time being, your state government also appoints local government councilors who make up the Local Authority, namely local municipal councils. Your councillors assist in the management and decision-making processes of the Local Authority by making by-laws and sitting on committees. The Local Authority is in charge of the management of districts, towns and cities, specifically in the areas of: local environmental matters, licensing of activities, public health, cleanliness of public areas, public amenities, social services and land use planning. 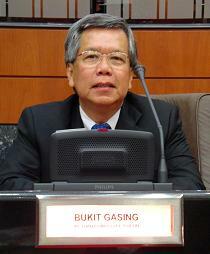 If you have a problem with any of the above issues, you may contact MBPJ at their hotline 03-7954 2020 or your Bukit Gasing Councilors (http://edwardleepj.blogspot.com/2008/09/bukit-gasing-councillors.html). Edmund Burke: "The only thing necessary for the triumph of evil is for good men to do nothing." Edward Lee was the N.34 Bukit Gasing State Assemblyman | Tourism, Consumer Affairs and Environment Assistant Exco Member to Elizabeth Wong | Special Select Committee on Competency, Accountability and Transparency (SELCAT) Committee Member | Ex-section 5 RA President | All Petaling Jaya Residents' Association Coalition (APAC-CAHC) Founder and Advisor.